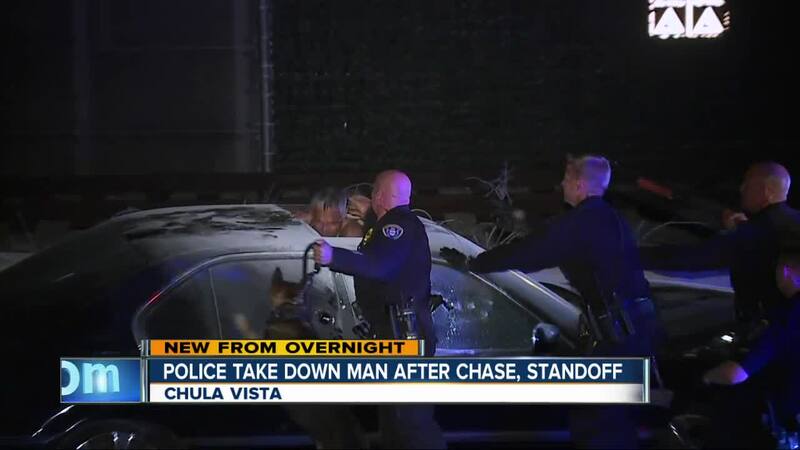 CHULA VISTA, Calif. (KGTV) - A man suspected of drunken driving was arrested after a pursuit and standoff in Chula Vista Tuesday morning. San Diego police said the incident began at around 1:30 a.m. when a driver refused to pull over on northbound I-5 near Palomar Street. The driver led officers on a pursuit on the freeway before exiting onto J Street. When he tried to get back on the freeway, the driver crashed. Officers surrounded the car and warned the driver he would be shot with pepper balls if he did not exit the vehicle. As the man continued to ignore officers’ commands, officers fired pepper balls at the car windows to get him to come out. At one point, the driver got out of his car, stood on top and then got back into the vehicle through the sunroof as officers approached. The driver tried to start the car, but it would not turn on. It was at that moment where officers opened the car doors and grabbed the man. He was arrested and faces charges of drunken driving and evading police.